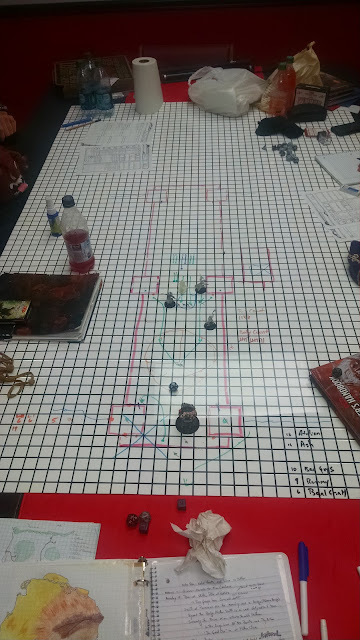 D&D is one of my favorite past times, and one I have played for many years. As I’ve mentioned, however, I’ve had difficulty writing about it in a manner that I enjoy. Either I get to nitty-gritty, and it seems I loose what it is to be D&D, or I get the birds eye view, and miss some of the more fun and interesting die rolls, and I think both of them will overshadow any good sort of storytelling of he adventure that I do. But, I’m going to try a bit anyway. Last week, as I mentioned earlier, we’d had a conversation about the direction of the adventure, where it wanted to go, and what we are going to do with it. I pointed out the four hooks, and they discussed it. Then, they tangented over to some perceived slight. And avenging it. See, a while back they were sent on a mission to retrieve a valuable relic from a monastery some threeish days down the road. The monastery had agreed to turn over the relic that they had been safekeeping to the Church of the Pantheon in Parminium, the city our characters abide in. Now, some months later, the Pontifex at the Pantheon hasn’t had any form of communication with the monastery and has not received his relic. In a bind, and desperate for the relic, he approaches the Obsidian Vault Reclamations to retrieve his item. He wants no one at the monastery harmed in the process, and definitely doesn’t want the relic or the building destroyed. He must have his relic, though. The characters passed on the job once, and upon returning to Parminium, heard that a number of other groups had taken up the job and none had returned. At this time they decided to take up the job. There were also rumors of a bridge somewhere to the south being held by bandits, and that job seemed like it was on the way. Might as well take up both. Making their way south along the Coast Road, they reached the bridge first, and it was definitely held by bandits. Solid stone and about 400′ across by best guess, with 6 towers and manned parapets, the bridge was a massive, ancient edifice. a half dozen men and women lounged at the edge of the bridge, and one approached, demanding a toll to cross. Thankfully, at the very least one of the characters was loaded down with coin and gleefully agreed that they would pay. As it happens, the bandits, serving a man they called the Great One, take payment on the other side, and they are escorted across. On the other side of the bridge, their is a circular shanty town inhabited by around 60 people surrounding another ancient structure that resembles a temple of sorts. Directly on the other end of the bridge is the alter, awash in dried blood, where the tithe is paid. Gladly, the single character pays it for everyone. The group of fanatics take umbrage at the slight, as they required all travelers to pay “greater than their fair share”. Unfortunately, its a very handsome amount of money, and they look the other way, all the while sweeping their coin into the collection plate. The young, bepimpled fellow who lead them across turns red with anger but says little. To a population such as this, gold is a scare commodity. Adventurers, its seems, are like Elephants. They never forget. They returned to town, gave the bell to the Pontifex, and made their way to their local inn, the Three Hounds. There, after we had our out of game discussion on the direction of the game, they held council on what to do next. It turns out they wished, beyond anything else, to tie up loose ends with the Great One and his damned followers. A plot was hatched. Many ideas were tossed about and grand schemes were laid. In the end, though, one was chosen. They made their way to the bridge, taking the job to ensure that the bridge was once again open to travelers and, especially, caravans from the south. Making their way to the bridge under the cover of night so as to ensure no one recognized them and attempted to make good on their promise, they approached the guards at the end of the bridge as travelers, and when the guards grouped slightly together, they attacked! two of the grouped guards were laid low swiftly, but the other fled as the watchmen in the tower sounded the horn to alert the town on the other side before taking aim with their crossbows and peppering the party with arrows. The group, fairly simply, dispatched the initial group of guards and cleared the towers – one member barged in and up to the Horn-blower, dispatching him while another blew a massive hole in the side of the other which, conveniently, allowed his friend to dispatch the guard in that tower just a little easier. The group rushed and made it through the first quarter of the tower with little resistance. Guards from the second and third sets of towers rushed down to to the end of the bridge to take assessment, and were quickly cut down. as the party pushed towards the midpoint of the bridge, however, things started to get a little messy. Bridge, One square is 10″. Ignore Rasheth. First, the doors to the middle towers were on the farther side of the bridge, so the party had little recourse but to suffer from a constant barrage raining down on them from above, with the occasional one striking home. Second, it looked like a veteran of many battles, grizzled and battle-scared, had gathered a few other men and were determined to fight off the attackers. The line was drawn across the center of the bridge. The veteran and his minions charged in, but were quickly overwhelmed and they, too, were slain, right as a second group of men, lead by a pair of veterans, came into sight. this was the largest of the groups yet, containing some half dozen men and women who took up defensive positions and begged for the party to come forward, which they had to. Where the previous veteran had lasted scarce seconds before a lucky blow cleaved him in twain, these too were made of much more durable materiel. Long they stood in the center of the bridge, raining down massive blows with the aid of their allies, working together in a concert of pain and blood. Party members fell time and again and each time precious healing was spent to bring them back to their feet. The Veterans, though, bid their time long enough, until the proper, gathered forces of the town were assembled and marched to the center of the bridge. There, among his men, the Great One took to the field, summoning a storm and using its battering wind and driving rain to his advantage, as well as hurling lightning bolts at his foe, though they never once connected. His personal bodyguards walked with him, and his small force approached at a quick, but not desperate pace. Unfortunately, this meant that they were bunched up, and they ended up, some dozen of them, shattered by the force of the bards voice alone. deprived of half his force, he quickly sent them into the battle to aid his veterans, who were wreaking havoc. Slowly, though, they were whittled down until an opportunity was seized and the Great one himself was attacked. Though the interloper was dropped, it forced his hand and he finally committed his bodyguards. With those final assets and a massive display of force by the Great one consisting of rippling the solid stone causeway of the bridge like a bedcloth, the the tide was turned.one after the other of the party fell until only two remained, the veterans of the OVR since the first day. The field was lost, and they withdrew, leaving three of their comrades on the ground, bleeding out. Thankfully, the Great One is a healer as well as a destroyer, and his magic recovered many on the ground from their wounds, including the attacking party. To them he gave a simple demand: In return for your lives that I have given to you, swear your fealty to me. One refused and tossed herself off the bridge, never to be seen again. One agreed to stay and serve him here, at the camp, foraging, hunting and providing lessons. The other swore fealty, but chose to spread the word. Alone, he returned to Parminium, a man scarred by his experiences and a little worse for wear. He’d been given up as dead, but now was alive as could be. And so, at the three hounds, they sat down, again, at the end of the session to decide which of the four hooks they should follow. some things change. Some things, do not.